A good, long, honest look into your heart may truly surprise you. You may find you actually relish those quiet night wakings when no one else is around. I remember in the middle of one night, I lay nursing Coleton by the light of the moon. The house was perfectly, peacefully quiet. As I gently stroked his downy hair and soft baby skin, I marveled at this tiny being beside me—and the thought hit me, “I love this! I love these silent moments that we share in the night.” It was then that I realized that even though I struggled through my baby’s hourly nighttime wakings, I needed to want to make a change in our night waking habits before I would see any changes in his sleeping patterns. We parents worry about our babies, and we should! With every night waking, as we have been tending to our child’s nightly needs, we have also been reassured that our baby is doing fine — every hour or two all night long. We get used to these checks; they provide continual reassurance of Baby’s safety. Co-sleeping parents are not exempt from these fears. Even if you are sleeping right next to your baby, you’ll find that you have become used to checking on her frequently through the night. Even when she’s sleeping longer stretches, you aren’t sleeping, because you’re still on security duty. These are very normal worries, rooted in your natural instincts to protect your baby. Therefore, for you to allow your baby to sleep for longer stretches, you’ll need to find ways to feel confident that your baby is safe—all night long. Once you reassure yourself that your baby is safe while you sleep, you’ll have taken that first step toward helping her sleep all night. You may hope, pray, and wish that one fine night, your baby will magically begin to sleep through the night. Maybe you’re crossing your fingers that he’ll just “outgrow” this stage, and you won’t have to do anything different at all. It’s a very rare night-waking baby who suddenly decides to sleep through the night all on his own. Granted, this may happen to you—but your baby may be two, three or four years old when it does! Decide now whether you have the patience to wait that long, or if you are ready to gently move the process along. Change requires effort, and effort requires energy. In an exhausted state, we may find it easier just to keep things as they are than try something different. In other words, when Baby wakes for the fifth time that night, and I’m desperate for sleep, it’s so much easier just to resort to the easiest way to get him back to sleep (rock, nurse, or replace the pacifier) than it is to try something different. Only a parent who is truly sleep deprived can understand what I’m saying here. Others may calmly advise, “Well if things aren’t working for you, just change what you’re doing.” However, every night waking puts you in that foggy state where the only thing you crave is going back to sleep—plans and ideas seem like too much effort. If you are to help your baby sleep all night, you will have to force yourself to make some changes and follow your plan, even in the middle of the night, even if it’s the tenth time your baby has called out for you. So, after reading this section and you’re sure you and your baby are ready, it’s time for you to make a commitment to change. 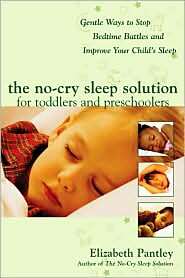 That is the first important step to helping your baby sleep through the night.